The stained cells are undergoing programmed cell death to create breakpoints - a rudimentary division of labor. Saccharomyces cerevisiae (brewer’s or baker’s yeast) is a unicellular fungus that is a common model organism. 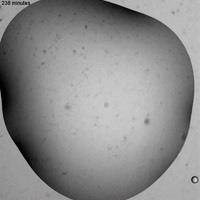 Yeast were an ideal choice for this particular evolution experiment - to produce multicellular yeast - for several specific reasons: (1) their short generation time allows for quick evolution; (2) they can be frozen to create evolutionary “time capsules;” (3) they are easy to grow in the lab; and (4) they have large population sizes, making selection efficient. Yeasts reproduce both sexually and asexually, but the latter is more common. In sexual reproduction, a single yeast cell undergoes meiosis and produces haploid spores; these spores can recombine with other haploid spores, producing a diploid cell – the yeast’s “normal” state. Asexual reproduction is a result of mitosis (cell division) in which the cell simply produces another copy of itself – this is called “budding.” It turns out the process of budding is essential to how the multicellular yeast work. There are two potential paths for yeast to evolve multicellularity. One is through the process known as “flocculation,” in which a bunch of yeast cells aggregate and form clumps called “flocs” (similar to a bacterial biofilm). The other path is to arrest budding before the daughter cell splits from the mother cell – this, in effect, creates two-celled yeast – and is called “post-division adhesion.” If this process continues long enough, a cluster, consisting of a large number of identical yeast cells, results. Before the experiment, we did not know which path the yeast would take to become multicellular (or even if they would). The method used to evolve multicellular yeast is simple. Clusters of yeast settle through liquid more rapidly than single celled yeast, in the same way that sand falls through water faster than fine mud particles. Each day, our yeast were given a mild centrifugation, and the bottom of the tube was transferred to fresh media. Within 60 days, multicellular strains of yeast that formed snowflake-shaped clusters evolved in all 15 populations. How did they become multicellular? Of the two possible paths the yeast could have taken to multicellularity – aggregation or post-division adhesion – the yeast all followed the latter. This path was particularly advantageous due to the fact that all cells in a snowflake are genetically identical to one other – they are all mothers and daughters – so competition among cells with a cluster is minimized (Hamilton’s r=1). In contrast, if there were multiple strains per cluster, as there could be with flocculation, competition among cells within the cluster would limit subsequent adaptation in multicellular traits. 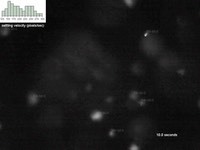 Snowflake yeast possess a new, multicellular way of growing. An adult snowflake produces multicellular propagules that are always less than half its size. These “juvenile” propagules then have to grow back to their parent’s size before they can produce their own propagules. The key step in the transition to multicellularity is a shift in the level of selection from individual cells to the multicellular cluster. Once selection is acting between whole clusters and these clusters respond by evolving multicellular traits - such as cellular division of labor, we know they are evolving as simple multicellular organisms. To see if this shift occurred, we performed a divergent selection experiment in which replicates of a single population were subjected to stronger or weaker settling selection. In response to stronger settling selection (less time to get to the bottom of the tube), they delay producing propagules until they are a larger size, allowing them settle more quickly. In response to relaxed selection, however, they evolve to reproduce at a smaller size than the common ancestor. Next we saw larger snowflake yeasts evolve a simple form of division of labor; in this case, higher rates of programmed cell death (apoptosis) within the cluster. 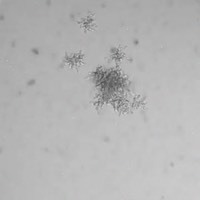 These dead cells serve as breakpoints from which propagules can bud off the cluster, allowing the snowflake yeast to regulate the number and size of offspring they produce. 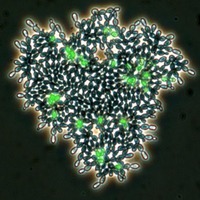 Cellular suicide would not have evolved if selection had not shifted to the multicellular-level, further demonstrating that snowflake yeast have made the transition to simple multicellularity.